Passengers travelling by boat would now able to confirm that those operating the vessels have been certified to do so, thanks to a new initiative, which requires vessels to display Maritime Administration Department (MARAD) stickers identifying the route they are plying. The call for the decals was made by boat operators, who sought to protect themselves and their passengers, a Department of Public Information (DPI) release noted yesterday. 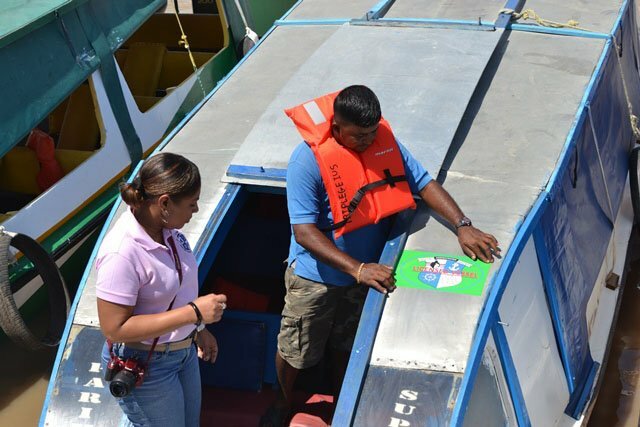 The stickers indicate that the boats are licensed and certified by MARAD and are safe for travelling. “The passengers will know it’s a licensed boat and it is not the ‘hustle boat’ because after hours, the hustle boat charges an extra fee and passengers blame all the boat operators including the licensed boats and captains as well, because they say they travelled on a boat and had to pay X amount of dollars. So, this will help them, it will shine a guiding light for passengers especially those who travel regularly,” Captain Narine, who travels the Supenaam to Parika route, said…..